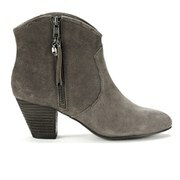 Women’s ‘Jess’ suede cowboy-inspired ankle boots with a stacked heel from high-end footwear brand ash. A black suede upper is set on a leather sole with a 6.5cm heel and features a side zip fastening with a skull charm detail and distressed marks for a vintage-style look. – L.R. Upper: Suede. Lining: Leather. Sole: Leather/Rubber. Heel Height: 6.5cm (approx.) 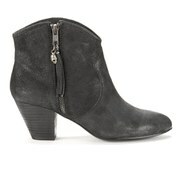 Please Note: Ash ankle boots have a very generous fit. If you are between sizes, we recommend you take the smaller size.